Every year on 12 October, family, friends and the local community come together to remember those who were lost in the 2002 Bali Bombings. It is also a time to celebrate life and resilience. Everyone is welcome to attend the ceremony. The program includes speeches, songs, flower laying & morning tea. Each year the Malabar community comes together at Cromwell Park to celebrate the lives of the nine Malabar locals who were lost in the 2002 Bali Bombings. Bring along your family, friends and a picnic and enjoy the live entertainment! The Malabar Family Day is organised by Malabar locals and supported by Randwick City Council. There are four memorials in Randwick City dedicated to the 88 Australians who were killed in the 2002 Bali Bombings. Randwick City has a special connection with this tragic event as 20 of the victims were from Sydney's eastern suburbs, particularly Coogee and Malabar. This memorial is a tribute to the Australian spirit of courage and endurance. The three linked figures in this sculpture signify family, friends and community. Bowed in sorrow and remembrance, they comfort, support and protect each other. The figures also symbolise life, growth, hope and our strength in unity. Individually, each figure could be easily toppled, but joined together they form a strong and supported whole structure. The memorial sculpture is three linked cast bronze forms of similar shape but different sizes, which stands approx four metres high overall. The sculpture weighs approx 1 tonne. The memorial stands alone near the top of the Coogee headland in a circular paved area. The sculpture, designed by sculptor Sasha Reid, is made of bronze, a strong and durable material. It is coated with a burnished green-brown finish and will be able to withstand the harsh coastal environment. The Memorial to the Victims of the Bali Bombing is an enduring feature for present and future generations to come to and pay their respects to the innocent victims of the 2002 Bali bombings, where 88 Australians were killed. It is dedicated to all those killed and injured in the Bali terrorist attack, as a place of remembrance and reflection for the community and for all the families, friends and team mates affected by the tragedy. Then Randwick Mayor, Cr Dominic Sullivan, initiated the Bali Memorial project, which was jointly funded by Randwick City Council and the NSW Government, and Council worked closely with the families of victims and independent art experts to select the winning design. As well as commemorating the victims, the Memorial also pays tribute to the Australian spirit of courage, strength in the face of tragedy and selfless help to those in desperate need. The Memorial was unveiled by NSW Premier Bob Carr on the first anniversary of the bombings, 12 October 2003, and is visited daily by many people who wish to pay their respects and remember those victims. 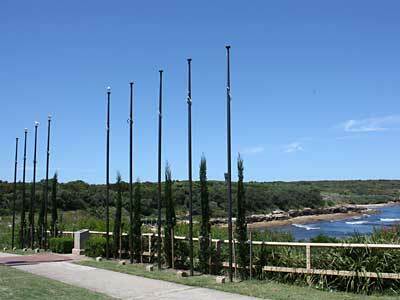 The Memorial has become a special place for many of the victims' families and the survivors, and is a focal point in Dunningham Reserve, Coogee Beach, which has been dedicated to the memory of the Bali bombing victims. 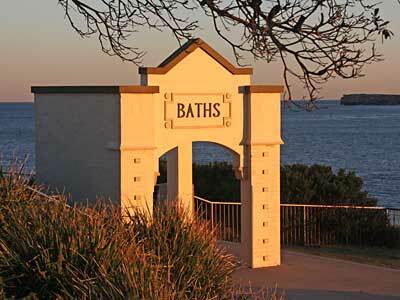 On 12 April 2003, at the 6-month anniversary ceremony on the memorial site, the point above Giles Baths on the Northern headland of Coogee Beach was officially named "Dolphins Point" by NSW Premier Bob Carr in memory of the six Coogee Dolphins footballers who were killed in the bombings. The Place of Reflection is a special sandstone wall and plaque with the names of all 43 NSW victims of the Bali bombings inscribed on it. 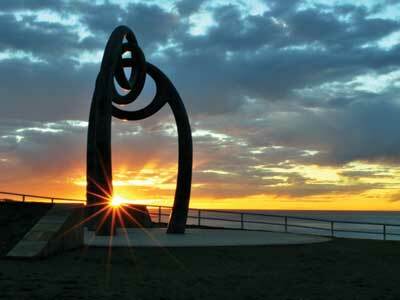 It is located at Coogee and was unveiled by the former Mayor of Randwick Cr Murray Matson with the former NSW Premier, the Hon. Kristina Keneally MP at the 2010 Bali memorial ceremony. Nearly half (43 of 88) of all the Australians that died in the Bali bombings in 2002 were from New South Wales. The Place of Reflection was built following requests from NSW families for a plaque with the names of all 43 NSW victims inscribed on it. There is no other place in NSW that honours their memory. At the Bali Commemoration Ceremony on 12 October 2009, the then Mayor of Randwick, Cr John Procopiadis, announced the Council would build a special sandstone wall, close to the main Bali Memorial, to carry the names of all the NSW victims. In 2010, the NSW Government provided a grant of $60,000 to assist with the cost of constructing the Place of Reflection for NSW Bali victims and the stairs down to the portico. Randwick Council covered the remaining cost of $145,000. "This Place of Reflection honours the memory of the 43 New South Wales victims of the 2002 Bali bombings. The Place of Reflection was created to support community healing, remembrance and the affirmation of love and life across present and future generations." each of the victims from the eastern suburbs was unveiled on the historic restored Giles Baths portico. The portico is located close to the Bali statue and the NSW Place of Reflection. The memorial summarises the tragic events of Bali 2002, and carries the names and photographs of the 20 victims from the eastern suburbs of Sydney. 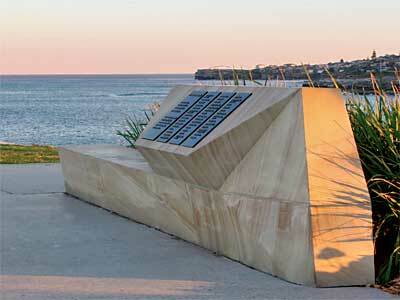 On 2 Feburary 2013, Randwick City Council installed a memorial plaque and sandstone plinth in Cromwell Park at Malabar Beach in memory of the nine victims in the Bali Bombings who were from Malabar. Nine flagpoles were also installed and these are only used once a year in memory of the victims. On the Sunday closest to the 12 October each year, the local community gathers to celebrate the lives that were lost. The nine Australian flags that covered the coffins of the victims are flown on this day only.